Enterprise TV may have gained some competition with the ever increasing popularity of streaming service providers like Netflix International. However, it may still be a great option for you to consider. If you are a small business owner looking an enterprise TV solution for your business, there are a lot of options out there. While this abundance of options available puts you at a wonderful advantage, it can also be a bit overwhelming. Thankfully, there are websites like this one to help you narrow down the field to only the best of the best. This post will highlight the top providers for enterprise TV. Then, it is up to you to decide which solution is the right fit for your business. If you have not already seen one of the many commercials DirecTV has running, you may not know about the awesome enterprise TV solutions they can offer your business. DirecTV is one of the largest and most well known names for cable providers. However, even better than having a well-known name offering your service is the fact that this company knows businesses well and caters directly to them. If you own a bar, you will definitely want to give DirecTV a try. They offer the best packages for sports, including NFL Sunday Ticket, which is ridiculously expensive through other enterprise TV providers. 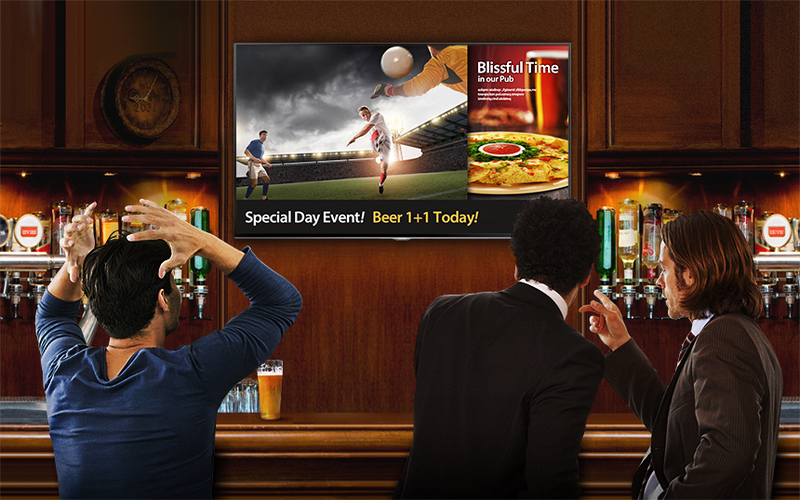 Your patrons will never miss a single game with DirecTV. The company also offers promotional materials and support which is a huge advantage it has over the competition. It is also an incredibly useful feature for you, at absolutely no extra cost. If you need an enterprise TV solution that offers great sports packages and even offers promotional support, DirecTV is the answer. Comcast Business is an excellent enterprise TV solution for those business owners that value a simple buying process, which is always smart business. The company offers four packages tailored to different sectors of business. These four packages are offered for bars, waiting rooms, gyms and hotels. They include various channels tailored to those specific environments and are offered for reasonable prices. If you want more of a selection for your customers, you can also opt to pay for additional channels, as well. Packages are available for just 45 channels all the way up to 150 channels. In addition to all these options, you can bundle internet and phone as well, which will secure you a great deal for your dollar. Comcast Business provides award winning service, too. So you will never have to worry about getting services fixed quickly and efficiently, if the need should arise. Comcast Business is an excellent enterprise TV solution for business owners who value good customer service and are looking to simplify their buying process as much as possible. Verison FiOS for Business is the last of the big three to make our list. Verizon FiOS is obviously an excellent solution if you are looking to bundle your enterprise TV with wireless internet. FiOS has consistently ranked as one of the fastest internet providers available. However, if you are not looking to bundle, you may want to know what, if anything, else makes them a viable solution for your enterprise TV needs. Well, the reason Verizon makes this list, besides their incredible internet, is because they offer customized packages to their business customers. For only $6/month, you can add a a package full of channels specifically curated for families, movies or sports lovers, among others. They also offer the widest array of packages, ranging from basic with 20 channels all the way up to an ultimate package that starts at 370 channels. If you need lots of channels for your enterprise TV, or the ability to bundle incredibly fast internet, Verizon FiOS is the solution for you. Many business owners doubt the effectiveness or benefits of enterprise TV solutions. However, there is definitely value in having TV for your business, especially if you are in the business of property development or are just looking to make improvements to an existing business. If you own and operate a bar and restaurant, you can easily earn additional income by hosting events for pay-per-view TV events. On the other hand, if you own an office building, you can earn additional income from tenants by offering specific lobby TV ad spots. There is a huge potential to gain the most value out of enterprise TV and earn additional income at the same time, so remember this when considering the options listed above. These are the top three enterprise TV solutions available now. You should consider them for your business. Depending upon your particular needs, one may be a better option over the others. If you use one of these providers for your enterprise TV needs, let us know your experiences in the comments below. First-hand accounts are the best resource available to business owners like you. We would love to hear from you!